This device is a programmer for AVR-based projects. The programmer emulates an AVRISP v2 on a virtual serial port, making it compatible with standard AVR programming software. Two additional features help with building and debugging projects: a TTL-level serial port for general-purpose communication and a SLO-scope for monitoring signals and voltage levels. A USB cable and ISP cable are included. 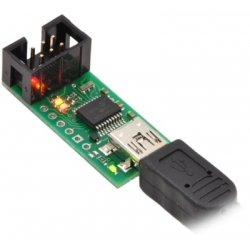 The Pololu USB AVR Programmer is an extremely compact, low-cost in-system programmer (ISP) for Atmel’s AVR mirocontrollers, which makes this device an attractive programming solution for AVR-based projects. The USB AVR programmer connects to your computer’s USB port via an included USB A to mini-B cable and communicates with your programming software, such as AVR Studio or AVRDUDE, through a virtual COM port using the AVRISPV2/STK500 protocol. 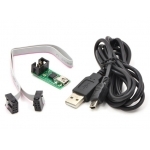 The programmer connects to your target device via an included 6-pin ISP programming cable (the older, 10-pin ISP connections are not directly supported, but it’s easy to create or purchase a 6-pin-to-10-pin ISP adapter). The programmer should work with all AVRs that can be programmed by an AVR ISP, but it has not been tested on all devices. The programmer features upgradable firmware, allowing updates for future devices. It does not currently work with Atmel’s XMega line of microcontrollers. The programmer has been tested under Windows XP, Windows Vista, Windows 7, and Linux. It is not compatible with any version of Mac OS or with older versions of Windows.